The US stock market was on the receiving end of a real RIMM job yesterday, with the maker of the Blackberry taking a bath with a 25% drop. Pandora, the day after their IPO dipped below their initial $16 stock (shock) value and Morningstar, who usually are content with being the megaphone for the economic propaganda emanating from our owners and masters state that their real value is $5. thus is just the latest in a strange, fractal synechdoche bit of moving sculpture/ performance piece/ electronic installation piece called the market. Don’t worry, as of noon taday, US markets are up an average of 0.40%. This is on the back of collective wisdom assuring us that Greece will greaze up for the international banks so they can complete the job on them and turn their land and infrastructure into property held by the banks. Vincent Van Gogh had a hard life, selling merely one of his paintings in his lifetime and that to his brother. His name is now cloaked in glory, with works ending up as wealthy art collector concubines and images of same gracing postcards and posters worldwide. The people and institutions involved in the above shenanigans are the same who decide what is declared important in art, what music is to be a real economic commodity. Also, the law does not apply to them. These are the people who are currently buying and selling Warhol art, in a pass-around similar to the collecting and trading of pokemon cards. This could be a Warhol bubble. Hedge fund managers are in the dual role of Pangenitor and Panphage for all art and culture just as they are for public companies and nation states. Does anything artists/writers/musicians do matter in the wider culture? Did it ever? Most of the creative types I know prefer to ignore such matters, but this may be a defensive posture in a world that does everything it can to discourage them from the path they’re on. And the ones rewarded end up effectively neutralized. Success in the outlying genres is a nice middle-management descent into stupor at best, or a terrible burden on top of the dayjob and what’s left for home life. Trailer for the documentary “What is ART? Inside the Mind of the Artist as They Speak the Truth” by Steven Johnson Leyba featuring H.R.Giger, Genesis P-Orridge, Howard Bloom, Joe Coleman, Richard Metzger, David J, Mark Bode and more answer the difficult questions, what is Art?what is TRUE ART?, what is the difference between art and entertainment?, what is more important the artist or the art? Is art important? It’s kind of a bourgeois thing to sit and speculate on w(h)ither art?, declare this form or that form dead, and debating back and forth to estimate the time of death. Hey, it’s all dead and in ruins along with the future, literacy and quite likely the industry currently eating up your time in exchange for the means and permission to stay alive for your natural span and do so in sheltered accomodations, owned or rented. The future is here, the future once promised is dead, long live the future, dead music and all. Levyarviot: Kkoagulaa – Aurum Nostrum non est Aurum vulgi :: Imperiumi.net. Kkoagulaa is founded by pretty much the same bunch of people who formed the very core of Manes, founded in 1993. Manes´s style was black metal at first, but later on they became more and more experimental with their music. The last Manes album, “How the World Came to an End” presented wide variety of styles from rap to electronica. 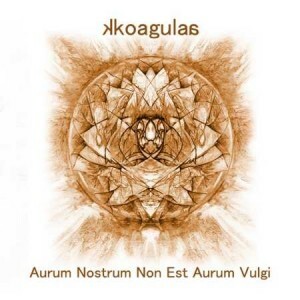 Kkoagulaas first album “Aurum Nostrum non est Aurum Vulgi” dives even deeper to the same waters, although this album is more coherent and long-lasting than its predecessor. “Aurum Nostrum non est Aurum Vulgi” consists of one 54-minute long track, including variations from minimalistic Ambient to exploding electronic beats and even squeaks from Niklas Kvarforth of Shining fame. Eventhough Kkoagulaa stretches further away from pop/rock category than for instance the two other Norwegian oddballs, Ulver and In the Woods…, comparisons to those two (especially their subsequent catalogues) are unavoidable. Comparisons to Scott Walker´s experimental body of work, Devil Doll and Aphex Twin are not too farfetched either. As a whole, the album is confusing and challenging without being pointless or artificial. Aurum Nostrum non est Aurum Vulgi is a unique case for a listener like me, who, aside from The Prodigy, doesn´t know much about electronic music. If the goodness or badness of music are the only criteria of categorizing the album, then Kkoagulaa belongs, without any hesitation, under the good music monicker. Having been writing reviews for a number of years, at times I find myself on virtual auto pilot when summing things up and feel I could do so with eyes shut and ears only half open. This I hasten is not an album that such principles can work with and although I profess to loving a challenge and getting stuck into something different from the norm Kkoagulaa have if anything come at me as a divine trial. This is so far from the norm that it virtually beggars belief and this is summed up in the pages of information that accompanied the download. The project is designed to “stretch out beyond genre conventions” and their mission is “to work in an expanded range of media and to even step outside of conventions of what constitutes avant-garde art and music” Alchemy is mentioned as the core behind both artist and work and the way they have turned their music into gold is a fascinating journey to undertake. As far as more background is concerned you can check out the detailed information at the band links below. the debut album “aurum nostrum non est aurum vulgi” (to be released by aural music) is receiving its last, finishing touches right now. audio is being finalized, artwork is being worked on, things have been dissolved and coagulated a lot of times… so, we have a lot of temporary audio, sketches, and stepping stones lying around, and here’s your chance to hear some of it. and there’s even more over @myspace.